Clean Up Your iTunes Library by Removing Duplicates and Fixing Track Data. You are now downloading Tune Sweeper for MacOSX. Read the Tune Sweeper End User License Agreement (EULA). How to Install Tune Sweeper. Alternately, you can find your Tune Sweeper download in your Downloads folder. Its called TuneSweeper.dmg. Double click this file to install Tune Sweeper. How to Uninstall Tune Sweeper. To remove Tune Sweeper completely from your Mac - simply drag and drop the Tune Sweeper icon from your Applications folder to the trash can on your dock. Thank you for trying Tune Sweeper. 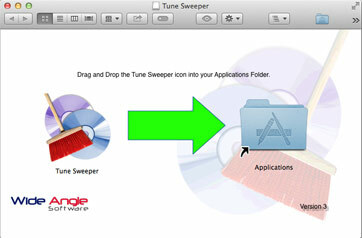 With the demo version of Tune Sweeper, you can explore the app. Tune Sweeper's features will display how it can clean and tidy your iTunes library, but will not perform any sweep or save the actions unless running the full version. All restrictions are removed in the registered version of Tune Sweeper. Tune Sweeper is fully registered when it has been activated with a purchased activation code.